Having the ideal mountain bike for your weekend or holiday ride is the best decision you could ever make. Merax Finiss 26 Aluminum 21 Speed Review will help you to choose best mountain bike. The Merax Finiss 26 Aluminum 21 Speed Mountain Bike with Disc Brakes is the best mountain bike that puts strength and durability at the top. It is built efficiently with a worry-free cycling ability, sporty looking and lightweight. Also, according to some Merax Finiss Mountain Bike reviews, this mountain bike is not just another ordinary bike. It is engineered to offer the best ride for mountain bikers – just what you are looking for! Keep in mind that most mountain biking trails consist of rocky and uphill terrains. Therefore, your mountain bike should be lightweight, easy to maneuver as well as carry, especially if the trail situation demands you for such. It is essential for a mountain bike to have a lightweight but tough frame. This enables a steady and a reliable support on the whole bike’s built. It also assures you that the mountain bike can endure the challenges on the trail. A mountain bike’s braking system should provide a reliable and speedy grip, especially on urgent situations. This is a safety feature you should not compromise. **Remember: A reliable braking system keeps you protected while on the ride. So, if you doubt the reliability of your bike’s brakes, it’s best to replace them or have them checked regularly, especially before you go on a ride. A mountain bike’s suspension system and saddle (bike seat) are the key factors for a smooth, ouch-free ride. The best ones of these are ergonomically designed to provide comfort especially on bumpy trails. So, it would be ideal to have an incredible suspension system and a cushioned (preferably memory foam) saddle for your bike, for a comfortable and sore-free trail time. In mountain biking, the higher the shifting capability a bike has, the better. This allows you to change gear according to the trail and to control the speed you would want to maintain during the ride. The Merax Finiss 26 Aluminum 21 is a mountain bike perfect for mountain biking and cross country rides. This bike's frame is made of 6061 Aluminum material which is strong and light. Its wheels are made of magnesium alloy which is lighter than aluminum. This mountain bike has a dual disc braking system, and has a lighter weight (34lbs.) compared to other mountain usual bikes . Also, this Merax Finiss 26 Aluminum 21 promises durability, consistency and easy maneuver in every ride. Although this bike is primarily used for mountain biking, it can also be used as a commuter bike. However, we highly recommend you to go for a different bike for general purpose. This bike might not be the best mountain bike available in the market. However, its budget-friendly price and best functional features is outstanding and making it a mountain bike worthy to add in your “to-consider” list. Let’s further assess this mountain bike by knowing its pros and cons. 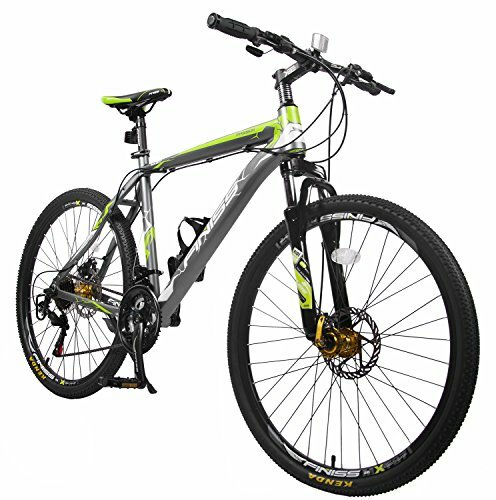 The Merax Finiss 26 Aluminum 21 with disc brakes is very affordable, as other mountain bikes are relatively expensive. This bike is tough, lightweight and easy to maneuver because of its aluminum frame. The bike has ergonomic magnesium alloy-made wheels that are sporty-looking. The mountain bike’s wheels are not made of a stronger material than steel or aluminum, so keeping a spare wheel might come in handy. The saddle might need some replacement work for a more secure and stable position. The Merax Finiss 26 Aluminum 21 has a frame made of 6061 aluminum which makes it tough and lightweight at the same time. The wheels are stylish and made from magnesium alloy which is relatively light. The wheels size of 26" is ideal in mountain biking and wheels are specially made to assure a smoother ride especially on bumpy trails. The disc braking system of the Merax Finiss 26 Aluminum 21 is adjustable and known to be strong and consistent. Where is the mountain bike made in? ​This is a China-made mountain bike. What is the overall weight of this bike? ​It's overall weight is around 34 lbs. What are the dimensions of this mountain bike? 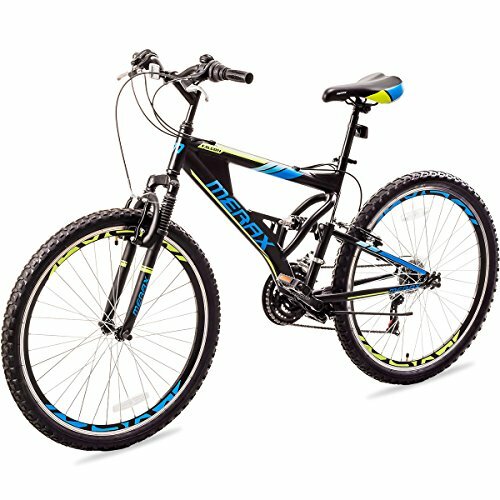 Is this bike fully assembled upon purchase? No, it’s not. However, you will not have a hard time taking this bike to assembly work as it is already 80% assembled. What is the amount of air pressure needed for this bike's tires? It needs 40bps of air pressure. 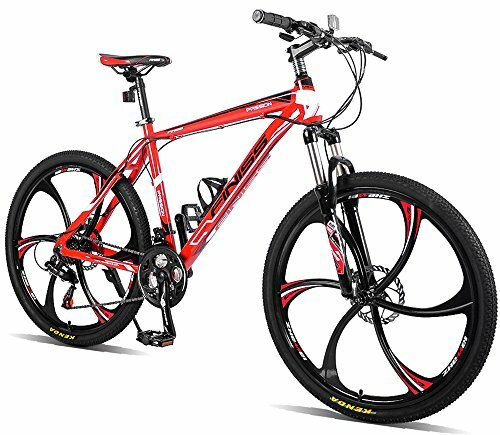 This Merax Finiss 26 Aluminum 21 Speed Mountain Bike is indeed the best and a smart choice for mountain biking! It's a relatively lightweight, has reliable disc braking system and a sporty-looking set of wheels.